In a scene closer to the climax, a bunch of cops molests a protestor by stripping her leggings off. When she kneels in front of her piece of clothing, instead of grabbing it, she picks up a lathi right next to it and thrashes the cops. That’s one of many examples of how hard-hitting Pa Ranjith’s second collaboration with Rajinikanth is. True to the words of Rajini during promotions, Kaala isn’t a political movie but it talks about politics, and when I say politics, it’s not about what happens at the two sabhas of our country. It talks at length about everyday politics that affect the laymen. Kaala must’ve felt like home turf for Pa Ranjith as the film is about those who don’t have anything but their lands and what happens when even that goes on the line. Seeing macroscopically, Kaala, similar to all of Rajini’s films in the last two decades, is a simple one-line story – a man’s struggle against a government for the rights of his people. But putting it in such simple terms won’t do justice to the layers Ranjith have weaved this film into. While we’ve seen the director voice his ideologies in his previous works such as Madras and Kabali in a subtle fashion, he goes no holds barred with Kaala. Though the premise gives him ample scope to preach and he has almost successfully done a decent job of not overdoing it. Kabali might’ve been half a Rajini film and half Ranjith’s but Kaala is predominantly a director’s film with a very little sprinkling of Rajini-ism – something which will surely divide the audience’s opinion on the film. The ‘actor’ Rajini we got a glimpse of in Kabali is showcased in full glory here and we just can’t get enough of Karikaalan. We see his love, comradeship, fatherly instincts, compassion, loss and even tears and Rajini nails his role perfectly. 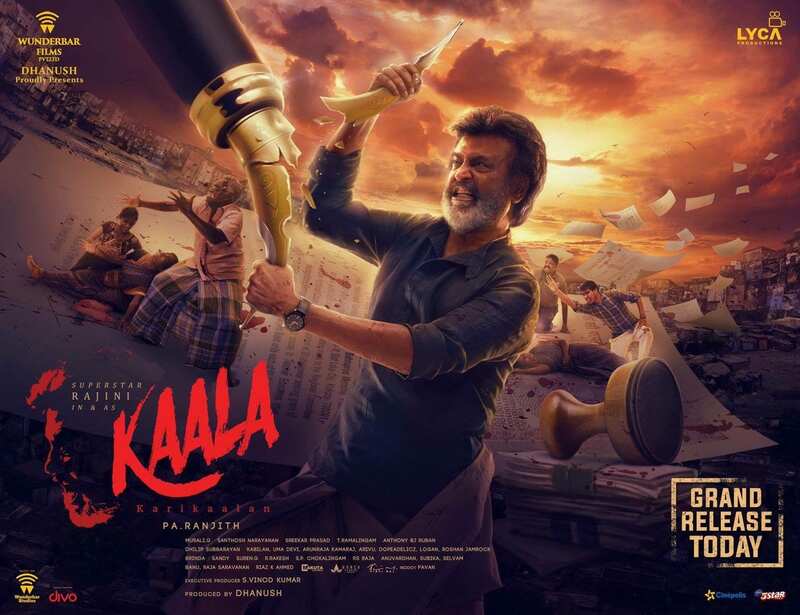 The first half is completely owned by the actor in him and despite taking its own sweet time to establish, it moves like a breeze thanks to some support in the form of stupendous performances from Easwari Rao and the surprise package – Huma Quereshi who is making her Tamil debut with Kaala. Ranjith once again proves that he’s the go-to man for translating human emotions on screen. The way he handles the scene between Rajini and the two ladies would surely remind you of his films in the 80s. While we’re at it I feel Kaala intentionally also pays homage to a few of Rajini’s previous blockbusters. For example, the Va di en thanga selai track would definitely remind you of Kick’u eruthey from Padayappa. Coming back to the characters, the cast choices are near perfect. Ranjith has also shined with his dialogues and the way he infuses his ideologies into the script. The Ram and Raavan references, breaking the white and black stereotypes and defining the difference between subjugation and self-respect are a few places where the director shows his prowess. The camerawork and art-direction too have done a neat job and narrating the history of Karikalan via VFX is a treat to any Rajini fan. What doesn’t work is the pace of the film. A few sequences feel dragged and could’ve been snipped at the editor’s table. The story also gets predictable after a while and the long climax doesn’t help either. Personally, I felt that Nana Patekar deserved a better screen space – after all, it’s not every day we get a villain who doesn’t shout, overact/react or end up with a fist fight with the lead. On the whole, Kaala is exactly what we expected and a lot more. While you wouldn’t see much of the Rajini-ism as I had mentioned earlier, Ranjith makes up it with his tricks in such a way that you really won’t miss the R factor.